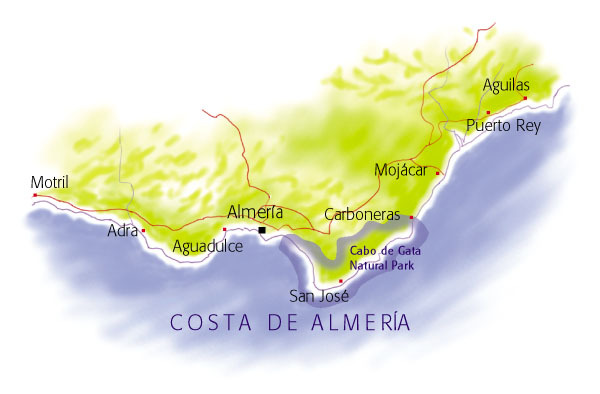 The map of the Costa de Almeria shows the main towns and cities of the area a well as major roads and the Cabo de Gata Natural Park. Where in the Costa de Almeria? Use the Costa de Almeria map, together with our villa search, to help you decide where in the area to choose for your villa break. To the east of Almeria the historic town of Mojacar and the coastal development of Mojacar Playa are popular choices, but it's also worth looking south towards the whitewashed resort of Carboneras, and into the Cabo de Gata Natural Park area. If you have reached this page without reading our introduction to villas in the Costa de Almeria then follow the link for more information about the area as a villa holiday destination.